We’ve got some great news from Omnisend—we’re unveiling the first item on our What’s Next 2018 plan: automated order updates. The brand-new updates to our automation workflows include shipping confirmation and cancellation confirmation. 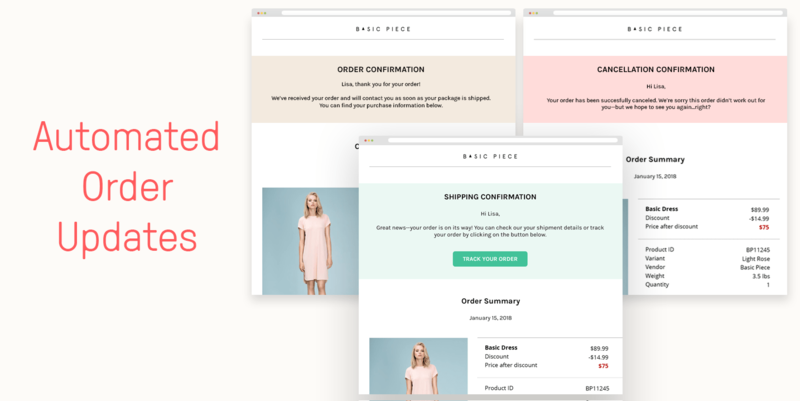 Mixed with our previous feature release of order confirmation, you’re now more than capable of giving your customers the most crucial information, while at the same time allowing more options for you to increase your sales. That’s why it’s so important you have a solid strategy in place. If not, I recommend you read our in-depth post on the best email marketing automation strategies (from basic to advanced). Let’s look at what’s new with our automation workflows. With our new shipping confirmation automation workflow, you can delight your customers by letting them know when their order has been shipped. This one is pretty easy to set up–all you need to do is set the Trigger to Shipping Confirmation. This is initiated when the fulfillment status is changed to fulfilled. Technically, you can also set a delay between the time the order is fulfilled and when the email is sent to your customer, though we can see no really good reason to do so. When you have good news, pass it on immediately. As always, you can change the layout of your shipping confirmation email to fit your brand and send the right message. We’ll go over some great ideas below. The next big thing we’re introducing is our cancellation confirmation automation workflow. Similar to the shipping confirmation above, the cancellation confirmation is pretty easy to set up. Simply choose it as a Trigger and edit the email content. Similarly, while you can add a delay to the workflow, it isn’t recommended as your customers would most likely want to get confirmation as soon as the order has been canceled. It’s pretty easy to edit the content of your cancellation confirmation email using our content editor to be consistent with your brand. For ideas on how you can use this workflow to increase sales, read some of our ideas below. 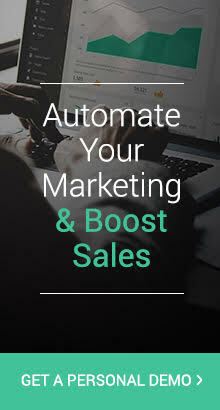 As I mentioned above, combined with our order confirmation automation workflow, these new automated order updates will help you boost your sales by increasing your customer’s lifetime value. This is because you can use the fact that people are eager for order updates and they naturally have a high open and click rate. In fact, order confirmations have a whopping 65% open rate and 17% click rate. You’d be crazy not to use this to your advantage. When you have your order confirmation and shipping confirmation automation workflows set up, you can customize the email to not just fit your brand but also nudge your customer to a second purchase. With all of these order automation workflows, there’s really no need to add in any delay, as you’ll want to get the info to your customer as quickly as possible. Here, simply set the triggers to ‘Order Placed’ for order confirmation and ‘Fulfilled status is fulfilled’ for shipping confirmation. Then, go ahead and edit your emails. For order confirmation, we’ve stated before that you can do many things such as getting reviews, offering discounts or showing off your bestsellers. When it comes to shipping confirmation, your subscriber has the option to track their orders (if you’ve used any shipping service that offers a tracking number), as well as the ability to view their order again (which takes them to the checkout page they saw when they first purchased the product). However, besides these important elements, we highly recommend you point your customers to thinking about buying from you again. This can be a simple “We’d love to have you again!” note, an unbeatable discount, or just showing your upcoming releases. For example, if the customer buys in February, you can give a sneak peek of your Spring line with an early-bird or pre-release price. When customers cancel orders, it’s probably not the best news for you. But rather than being disappointed and just sending the cancellation confirmation email, you should take this as an opportunity to convert that opportunity into a sale. Remember, order emails have really high open and click rates. This means that each action taken by the customer is another opportunity for you to sell. The obvious method here is to offer free shipping or a special discount if the customer canceled the order for any reason. Or you can take them to a special landing page where you can show them again why you have the perfect products for them (with a tantalizing offer of course). 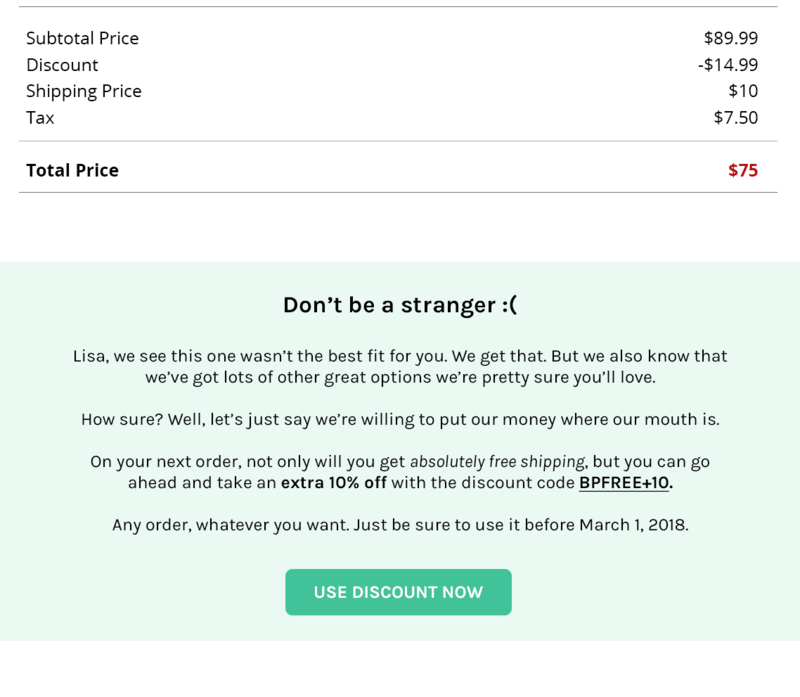 When you combine this with the order confirmation email, you get a 1-2 punch where you can really get your subscriber motivated to buy from you again, even if this particular purchase wasn’t successful. After all, if the customer was motivated enough to buy from you the first time, it’ll be much easier for you to convert them again. All you’ll need to do is find the biggest point that will influence them to make that purchase. Let us know what you think of our exciting new automated order updates and how they’re helping you build better relationships with your customers. 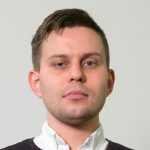 Gytis is a Product Marketing Manager who loves showing how all the great features the Product team is building can be really actionable for all our users.